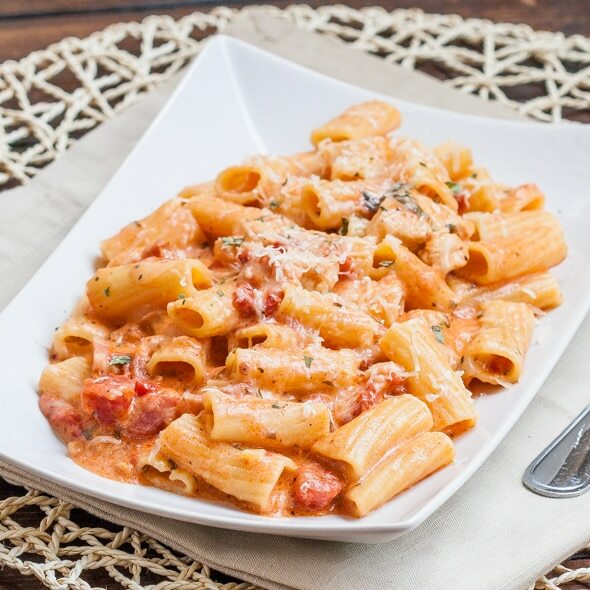 Rigatoni in Blush Sauce with Chicken and Bacon – delicious creamy and cheesy pasta, dinner in 30 minutes. I love long weekends, I especially love the fact that I have more time to do the things I enjoy doing and don’t have to rush and get everything done. As much as I love long weekends, I hate when they are over. Yesterday was Labor day and I know everyone makes burgers and hot dogs for these long weekends, but I was in the mood for pasta, plus I can have leftovers to take to work for lunch. I for one love pasta dishes, my husband not so much, so that’s why there are always left overs. But you know why I love pasta dishes? Because they are so easy to make and because you can just throw whatever you have in your fridge and make one delicious meal. So that’s what I did for this pasta dish, I did not use a recipe, but used whatever ingredients I had. I had some chicken breasts and some bacon so that’s what I threw in my pasta. The sauce is very simple to make, chicken, bacon, onion, diced tomatoes and I threw in some sour cream to turn it into a blush sauce. I also added some hot sauce to spice it up a bit. I only used half a package of rigatoni here because I only wanted 4 servings, but feel free to double the recipe. 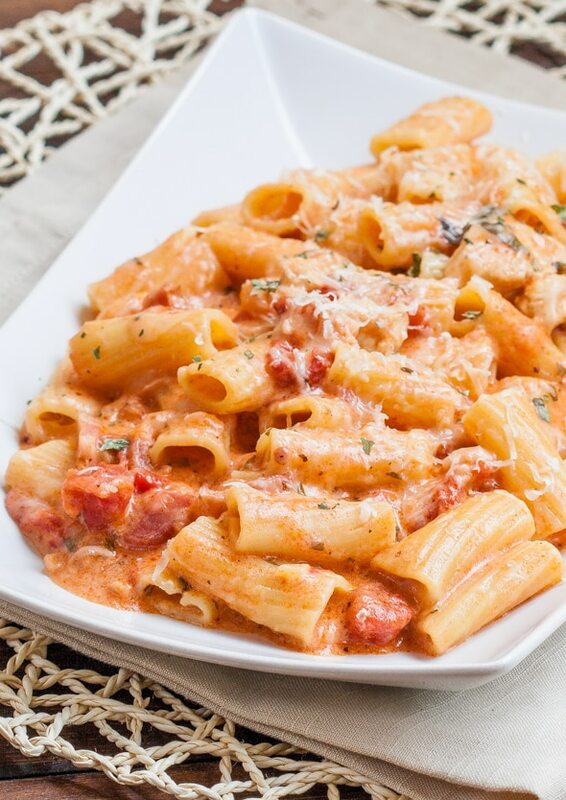 This pasta turned out amazing, so delicious, creamy and cheesy. You’ll love it. Rigatoni in Blush Sauce with Chicken and Bacon - delicious creamy and cheesy pasta, dinner in 30 minutes. In a large skillet, add the bacon and cook it until it starts rendering some fat. Add the chicken, onion and garlic and cook until chicken is no longer pink and is cooked through. Add diced tomatoes, water, basil, hot sauce, and cook for 10 minutes. Add sour cream and stir. If needed add salt and pepper to taste. Add the pasta to the skillet, add the mozzarella cheese and toss it all together to make sure all pasta is covered in the cheese and sauce. Grate with fresh Parmesan cheese and serve warm. I finally tried this tonight! It was so good 🙂 My husband told me that I can cook now! haha thank you for the great recipe! Made this today and so delicious!! Only thing I changed was I used crushed tomayoes as hubby doesn’t like chunks of tomato in dishes and I only put a heaping tablespoon of hot sauce. I think 2 tablespoons would have been too spicy. Will definitely make again! Hello, How much basil should be used? How many leaves or teaspoons? I would use 2 tsp dried or 6 leaves fresh, chopped. The recipe says one can two cups of tomatoes. Do you mean one can or two cups or one can plus two cups? Hi Lynn! Fixed it, 1 can which is roughly 2 cups. Thanks. Hosted Friendsgiving for 20-somethings. Making Mom food tomorrow. This is Mom Food. Can you use fresh mozzerella? Of course you can. I love fresh mozzarella and I use it in dishes like this whenever I have it. Did you put the noodles in cooked already or not? You probably could, but I would go with the Greek yogurts. I made this for my family tonight. It was a huge hit with the kids and Huz. Thanks so much! Only changes I made were I added 1/4 cup of sour cream and a 1/4 cup of heavy cream. Also, i didn’t have crushed tomatoes, so I used spaghetti sauce. So glad you guys all liked it. Great substitutions! Can i use bow tie pasta? I made this last night, and it was outrageously good! I used Sriracha instead of Frank’s because I already had it, but I can definitely see where a more vinegar-y hot sauce would be really tasty in this dish. I found your blog on StumbleUpon, and I will definitely be coming back for more recipes. Keep up the great work, Jo! Are you suppose to drain the diced tomatoes? Came across this recipe on Pinterest. Made it tonight with shrimp instead of chicken – yum! Thank you so much for the recipe…it was just delicious! Do you chop up the bacon and then cook it or the whole slices? I used to cook the whole slices of bacon, but I found it easier to chop them up first and then cook them. Substituted leftover (cooked) turkey for the chicken. VERY yummy!!!! Glad you liked it Ellie! I live in Australia so I cannot get “Frank’s Hot Sauce”, what would you suggest as a substitute? Not really sure what’s available in Australia, how about Tabasco sauce? I saw your recipe on pinterest and decided to try it. It was delicious and I’ll be making it again and again! Thanks! This recipe is delicious! A new favorite! Thanks for sharing, Jo!